Beloved patriarch B. Wilbur Rieke, Sr. passed away on December 25, 2018, at the age of 90. He was an Oakhurst resident for the past 25 years. 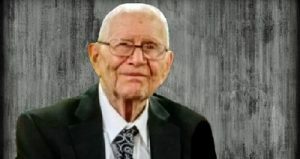 Wilbur will be deeply missed by his wife of 70 years, Leela Rieke, and their children Lelene Rieke, Bernie Rieke, Jr., Diana Gardner, Carissa Crain, Johnny Rieke, and … Continue reading Services For B. Wilbur Rieke, Sr.